Italian painter and printmaker. His altarpieces and history paintings, which unite late Baroque classicism with Venetian colour, brought new life to north Italian painting. The son of Lucia Boschetti and Francesco Balestra, a wealthy merchant, he studied literature, rhetoric and the humanities, but, after lessons in drawing and perspective with Giovanni Zeffis (d. 1688) and one Monsignor Bianchini (1646-1724), he moved to Venice in 1687 and trained with Antonio Bellucci. In 1691 he transferred to Rome, where he studied with Carlo Maratti, whose art continued a classical tradition that can be traced back to Raphael, and where he also absorbed the work of Annibale Carracci and Domenichino. In 1694 Balestra s large drawing of the Fall of the Giants (Rome, Galleria Accademia Nazionale di S Luca) won first prize in a competition at the Accademia di S Luca. In 1695 he returned to Verona, where he was acclaimed as the chief exponent in the Veneto of Maratti s late Baroque classicism. His pictures of this period were mainly small religious works, such as the Agony in the Garden (private collection). In Verona he established a school of painting. 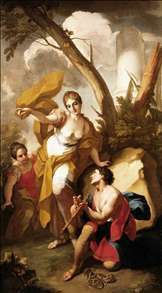 See more details about "Theseus Discovering his Father's Sword"